Posted on September 25, 2018 by Jonathan R. Grant, M.D., F.A.C.S. While it is true that the majority of individuals seeking plastic surgery continue to be women, more men are joining them in enhancing their appearance. The latest annual report from the American Society of Plastic Surgeons reveals that more than 1.3 million plastic surgery procedures were performed on men in 2017 alone. Among the most popular plastic surgery procedures among men are those that focus on the face. For instance, the number of men who underwent dermal fillers in 2017 increased 99 percent from 2000, and the number of men seeking Botox® nearly quadrupled! What’s behind this surge? Mt. 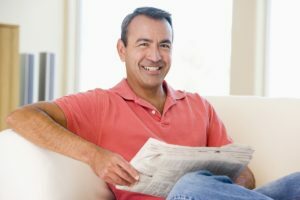 Vernon plastic surgeon Dr. Jonathan Grant, M.D., F.A.C.S., shares the top reasons why more men are seeking facial plastic surgery. Statistics shows that more men in their 50s, 60s and older are undergoing facial plastic surgery procedures. Many of these men report wanting to look younger to continue competing in the workplace. Older men want to look fresh and alert next to their younger colleagues, and procedures like facelift and eyelid surgery can help them achieve their desired look. Even non-surgical treatments like Botox® and dermal fillers can provide noticeable improvement to help aging business executives “look the part” of an energetic leader. Not all plastic surgery procedures are performed solely for cosmetic reasons. In addition to addressing cosmetic imperfections of the nose, rhinoplasty can improve breathing and other functional problems caused by a structural abnormality. Eyelid surgery, a popular procedure for rejuvenating the eyes, can also be performed to remove heavy skin and fat on the upper eyelids, which can impair vision. Whether it is an oversized nose, an unattractive double chin, or even noticeable premature wrinkles, many men can spend years embarrassed or self-conscious about a certain facial feature. Insecurities about their appearance can even cause men to become withdrawn from social activities or avoid career and romantic opportunities. The transformative results of facelift, rhinoplasty and other facial plastic surgery procedures can give men the boost in self-esteem they need to approach social, romantic, career and all other opportunities with a positive and confident attitude. Dr. Grant understands that men want to look and feel their best while still retaining a sense of masculinity. He has years of experience treating hundreds of men and has refined his surgical techniques to help them achieve noticeable results without compromising their masculinity. Dr. Grant’s goal is always to deliver rejuvenating yet natural-looking results. To discuss your cosmetic needs and goals, please contact Dr. Grant’s Mt. Vernon office at (360) 336-1947 and schedule an appointment today.